A beautifully illustrated mini edition of the much-loved Christmas story with a spectacular pop-up finale. A beautifully illustrated edition of the much-loved Christmas story with a spectacular pop-up finale, from Niroot Puttapipat, illustrator of The Night Before Christmas and Jingle Bells. The Nutcracker story is a much-loved part of Christmas celebrations around the world, and this beautiful edition captures the excitement of Christmas Eve and the magic of Marius Petipa's classic ballet. 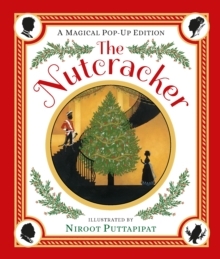 Exquisitely illustrated, this charming retelling follows Clara's magical journey with the Nutcracker Prince and ends with a stunning pop-up of the Land of Sweets! The perfect Christmas stocking filler.